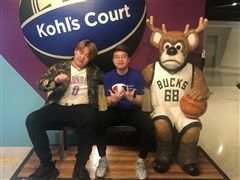 Students from the WLHS International Program and Student Homes Program attended the Milwaukee Bucks game on April 10, versus the Oklahoma City Thunder. 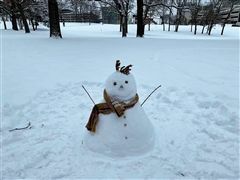 If you can't beat the cold and snow, you might as well enjoy it! This semester, we are blessed to have six new international students join our WLHS family. They come to us from China, South Korea, Vietnam and Uganda. WLHS held an orientation day for the new students on January 4, so that they could get acquainted with the school building and understand the basics of how to get a successful start at our high school. The students' American mentors joined in the late morning to introduce themselves, share tips, and help locate lockers and classrooms. 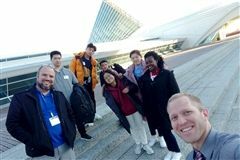 In the afternoon, the new students toured the top sights of Milwaukee including Lake Michigan, Milwaukee Public Market, and Milwaukee Art Museum. 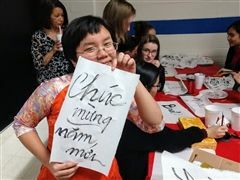 In the evening, students had dinner with their house parents and learned about the residential program at WLHS. Welcome to our new students! 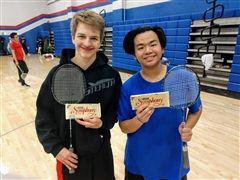 The “American Mentor to New International Student” program held a badminton tournament in the school gymnasium on November 6. Students have the opportunity to stay in student homes with caring, qualified house parents. House parents provide assistance and oversight to ensure good study habits and positive socialization. Students staying in the student homes will also have organized activities available after school and on weekends to ensure cultural experience, as well as structured free time during the week. WLHS also arranges home-stays in very special circumstances for a limited number of students, or in the event student homes are at capacity. An additional fee of $5,000 is added to the total cost of tuition and fees if a student requests and is placed in a host family. WLHS is located in the city of Milwaukee in the state of Wisconsin, which is in the northern Midwest region of the United States. It is the 26th most populous city in the United States and is located just 70 miles from Chicago. The area has a wide variety of culture, including excellent museums, galleries, and theaters, and is nationally-known for its festivals. It also is home to several professional sports teams as well as many great public parks to enjoy. Discover more about Milwaukee.